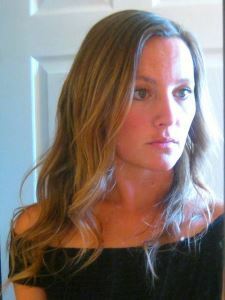 Are you looking for a light meal for those hot summer nights? When the weather warms, the last thing you want to do is turn on the oven or prepare a hot, heavy meal. 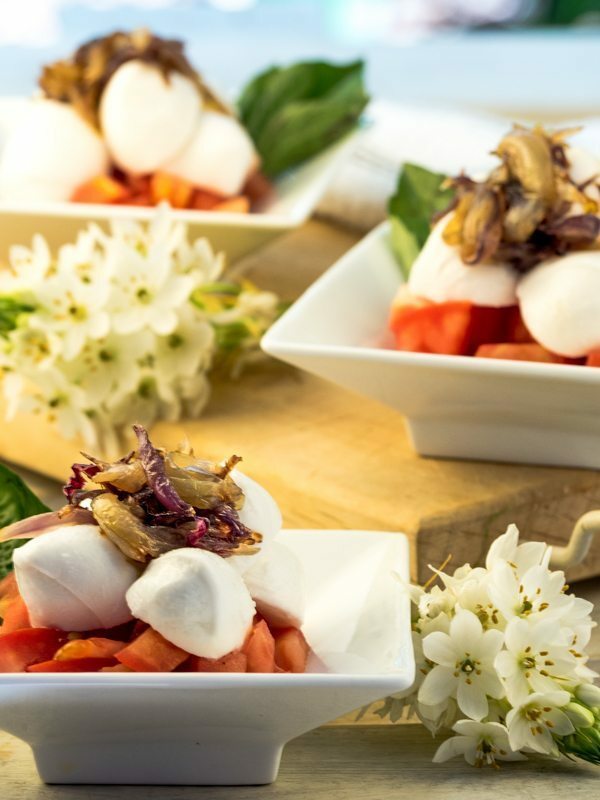 This Bocconcini Caprese is the perfect balance of refreshing fresh veggies, delicious cheese, and zesty balsamic vinegar. For this meal, you’ll simply be tossing together juicy diced tomatoes with olive oil and salt while the onions are caramelizing in your skillet. At that point, your meal preparation is as easy as layering the tomatoes, bocconcini, basil leaves, and onions in your serving dish and then drizzling balsamic vinegar over the top. What a great recipe for a summer appetizer or light meal out on the back patio! 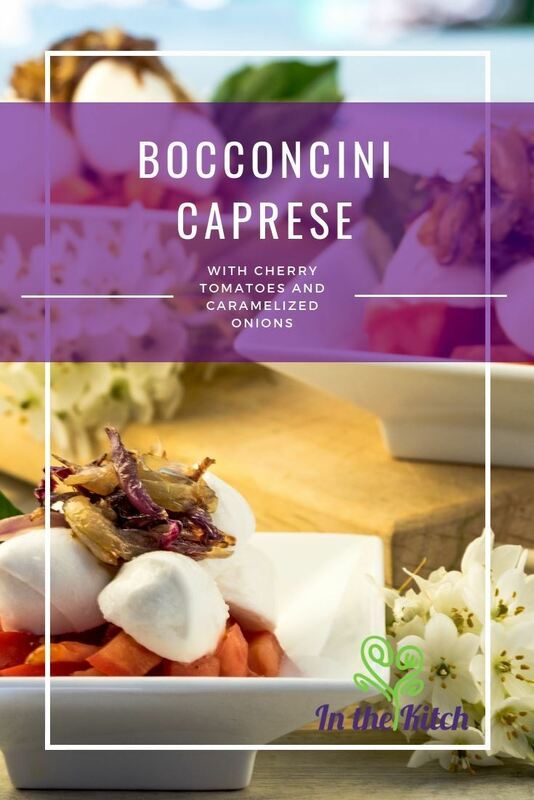 This Bocconcini Caprese is the perfect balance of refreshing fresh veggies, delicious cheese, and zesty balsamic vinegar. When butter is melted, add onions. Toss with a spatula until onions are fully coated in butter. Reduce heat to low and cook – stirring frequently – for about 30 minutes, or until soft and golden. In a medium bowl, add the tomatoes, olive oil and salt and mix well. 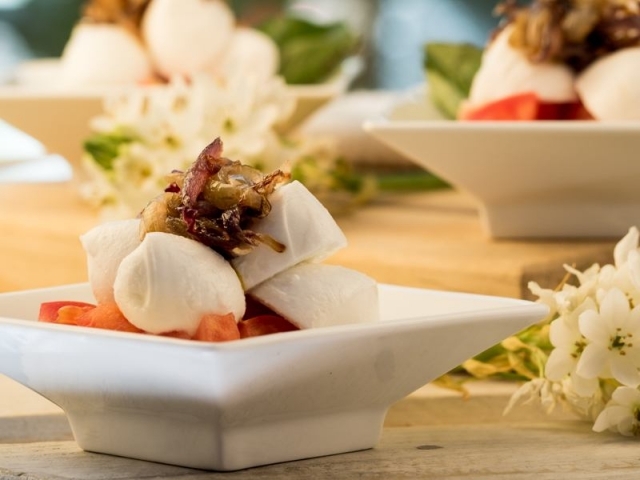 In each serving dish, stack the tomatoes, bocconcini, basil leaves and caramelized onions. Top with balsamic vinegar and serve. 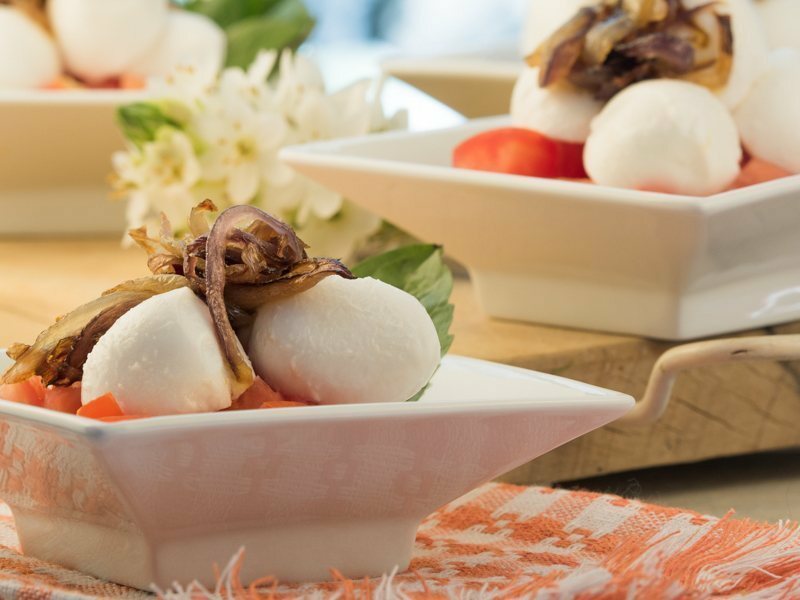 Bocconcini is merely a fancy term for small mozzarella balls. These cheese balls can be the perfect compliment to nearly any Italian appetizer or zesty dish, as they provide just the right amount of cheese without overpowering the other flavors. 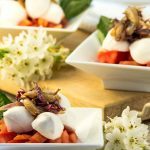 Bocconcini Caprese salad is traditionally made without onions, but the addition of these caramelized onions gives this recipe a step-up in sweetness and will help bring out the flavors of the other ingredients. The caramelization will also add a tinge of nuttiness to the dish, as well as adding extra color variation. You could make this dish even more unique by choosing a non-traditional flavored balsamic vinegar, such as an oregano balsamic or even a fruit-flavored vinegar for an extra dash of sweetness. We hope you enjoyed this recipe! Have you made a Bocconcini Caprese similar to this? What do you think of the addition of caramelized onions? We’d love to know your thoughts in the comments, and please share this recipe if you liked it!